KIND Healthy Grains are a tasty, diverse mix of whole grains that works great as a snack or as an add-in for yogurt or other types of food. Eating whole grains usually requires 20-60 minutes of cooking and cleanup. KIND Healthy Grains Clusters are ready instantly. Regular granola is just made from oats. KIND Healthy Grains is made from a diverse mix of oats, buckwheat, millet, amaranth, and quinoa. They're extremely versatile. They work as a quick snack, an add-on to foods like yogurt, or the base for a complete meal. They're low in sodium with just 35mg (1% DV) of salt. They contain 1 added vitamin: Vitamin E.
They contain at least 3 added sweeteners: brown rice syrup, dried cane syrup, and tapioca syrup. Sweeteners improve taste and are okay in moderation. However, sweeteners also add unnecessary calories, often make you hungry, and raise your blood sugar. They contain soy protein isolate as an ingredient. Soy protein isolate is less nutritious than a whole grain. It also often contains unhealthy additives like aluminum and hexane. Some people are also allergic to or intolerant of soy products. They contain at least 1 potential allergen: peanuts. They contain refined grain flour (tapioca starch) instead of a whole grain equivalent. Refined flour is usually less nutritious than the whole grains its made from. In addition, flour generally raises your blood pressure more than whole grains. WHOLE GRAIN BLEND (OATS, BROWN RICE, BUCKWHEAT, MILLET, AMARANTH, QUINOA), DRIED CANE SYRUP, SOY CRISP (SOY PROTEIN ISOLATE, TAPIOCA STARCH, CALCIUM CARBONATE), PEANUT BUTTER, PEANUT OIL, TAPIOCA SYRUP, PEANUTS, PEANUT FLOUR, BROWN RICE SYRUP, SALT, VITAMIN E (TO MAINTAIN FRESHNESS). Are KIND Healthy Grains non-GMO? Yes. KIND Healthy Grains do not contain genetically modified ingredients. From KIND's Ingredients FAQ: "All KIND® snacks do not contain genetically engineered ingredients. The Non-GMO Project seal appears on the majority of our KIND Healthy Grains® and Pressed by KIND® products. Some of our other snacks are pending Non-GMO Project certification." Are KIND Healthy Grains organic? No. KIND Healthy Grains are not organic. From KIND's Ingredients FAQ: "We are not currently pursuing organic certification for our snacks. Our top priority is to invest in high quality, premium ingredients, while keeping our products accessible. We work closely with our suppliers to ensure that their standards are in line with KIND’s brand values." Are KIND Healthy Grains Whole Grain Clusters vegan-friendly? Yes. KIND Healthy Grains Whole Grain Clusters are vegan-friendly. All 20 ingredients are vegan-friendly. Are KIND Healthy Grains Whole Grain Clusters gluten-free? Yes. KIND Healthy Grains Whole Grain Clusters are gluten-free. All 20 ingredients are gluten-free. Are KIND Healthy Grains Whole Grain Clusters dairy-free? Yes. KIND Healthy Grains Whole Grain Clusters are dairy-free. All 20 ingredients are dairy-free. Are KIND Healthy Grains Whole Grain Clusters keto friendly? No. KIND Healthy Grains Whole Grain Clusters are not keto friendly because they contain whole grain blend, oat, brown rice, buckwheat, millet, amaranth, quinoa, dried cane syrup, tapioca starch, tapioca syrup, and brown rice syrup. Are KIND Healthy Grains Whole Grain Clusters lactose-free? Yes. KIND Healthy Grains Whole Grain Clusters are lactose-free. All 20 ingredients are lactose-free. Are KIND Healthy Grains Whole Grain Clusters paleo? No. KIND Healthy Grains Whole Grain Clusters are not paleo because they contain whole grain blend, oat, brown rice, millet, dried cane syrup, soy crisp, soy protein isolate, tapioca starch, peanut butter, peanut oil, peanuts, peanut flour, and brown rice syrup. Where can I buy KIND Healthy Grains? 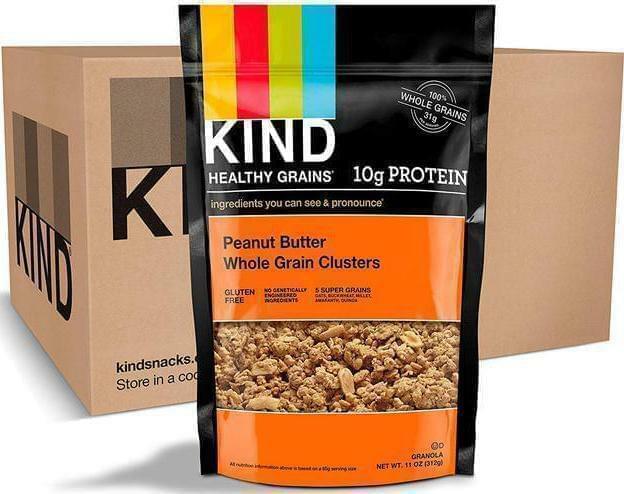 KIND Healthy Grains are available on Amazon, Walmart, Target. KIND Healthy Grains Whole Grain Clusters are made by KIND Snacks.